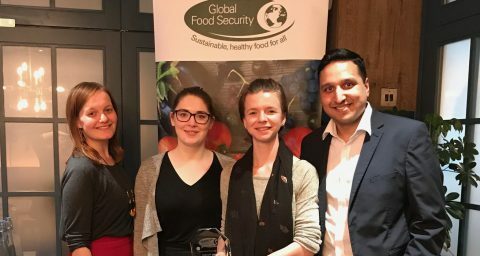 The Global Food Security programme aims to understand how increasingly severe extreme weather events and environmental tipping points have the potential to impact on the global food system, as well as identify approaches to prevent and mitigate these impacts. These reports were unveiled at a Parliamentary event attended by MPs, policy-makers, leading industry figures, researchers and funding agencies. The findings of the UK-US Taskforce were presented at a session of the AAAS meeting 2016. The session panel also conducted a briefing on the taskforce findings for US Senate staff. GFS collaborated with the Foreign and Commonwealth Office (FCO) in Beijing to hold the UK-China workshop on extreme weather and global food system resilience. This synthesis report presents evidence that the global food system is vulnerable to production shocks caused by extreme weather, and that this risk is growing. Preliminary analysis suggests that the risk of multi-breadbasket failure from extreme weather will triple, going from a 1-in-100 year event to a 1-in-30 year event by 2040. 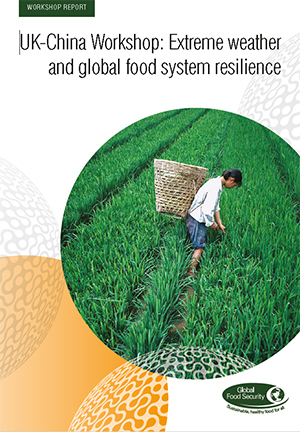 A number of recommendations are made to improve resilience of the food system. 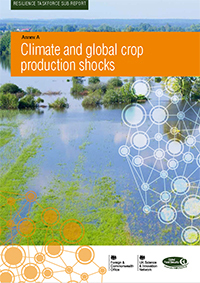 This report presents a set of scenarios for weather-driven production shocks that are plausible in the present or near future climate. This work highlights the risks extreme weather poses to global food production, recommending further investigation into the meteorological teleconnections between major food production regions and the probability of coincident shocks in multiple breadbaskets. Impacts of extreme weather-related food production shocks can be heightened by protective policy responses that further amplify price volatility and market shocks. 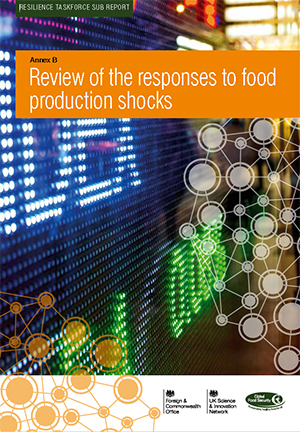 Through data analysis, literature reviews and expert interviews this report puts forward potential government and market responses to food production shocks in major crops that might create a more resilient food system. 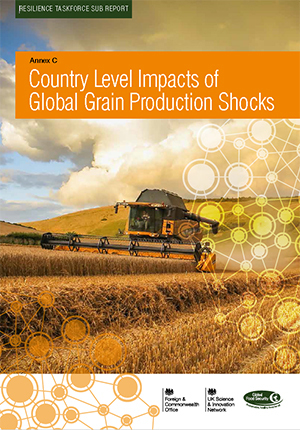 This report examines the impacts of potential extreme weather-related shocks to global grain production at a country level. Key recommendations include encouraging countries to take measures to reduce their exposure to grain production shocks, and more public-private partnerships to play a role in lessening the impact. In 2014, GFS established a UK-US Taskforce on Resilience of the Agri-Food System to Extreme Weather Events in collaboration with the Foreign and Commonwealth Office (FCO) and Science and Innovation Network (SIN (PDF)). Sir John Beddington commissioned a report on food system resilience from the UK’s Food Research Partnership, for which GFS coordinated an expert subgroup. Following his illustration of the ‘perfect storm’ scenario, Sir John Beddington commissioned GFS to establish a programme of work considering the resilience of the global food system. 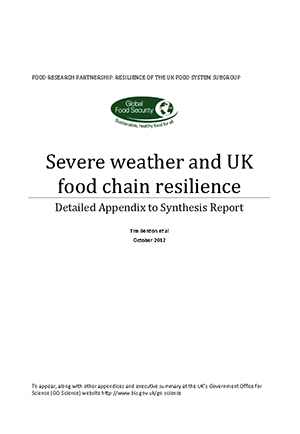 A report on food system resilience from the UK’s Food Research Partnership was also commissioned, for which GFS coordinated an expert subgroup. This report details the work of this subgroup. 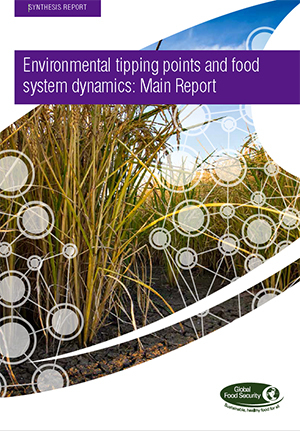 More research is needed to better understand environmental tipping points and their potential impact on food system dynamics, the interaction between environmental tipping points and socio-economic systems, and ways to improve forecasting. While there has been a wealth of research to better understand how the average global climate is changing, we have far less of an understanding of how the extremes of different weather variables – such as temperature and rainfall – may change. 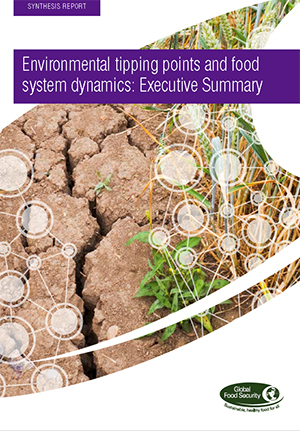 Equally, relatively little attention is given to environmental tipping points and the need to include any such potential step-changes in ecosystem services as part of food systems risk management. When considering resilience of the food system, the potential for climatic shocks such as extreme weather events or environmental tipping points are just as important as average changes in climate; for example, harsher heatwaves and cold snaps, more severe floods and droughts (ref 1), or more permanent step-changes in biophysical systems that alter the provision of environmental goods and services. These events have significant potential to negatively impact food production, disturbing food supply chains both locally to the shock and at a global level should a major production region – or global “breadbasket” – be affected (ref 2). In these cases, the associated drop in production can trigger rapid increases in global food prices, having serious consequences for global food security – increasing household food expenditure, reducing access to sufficient good quality food in poor communities, and even triggering civil unrest in areas with fragile governance. 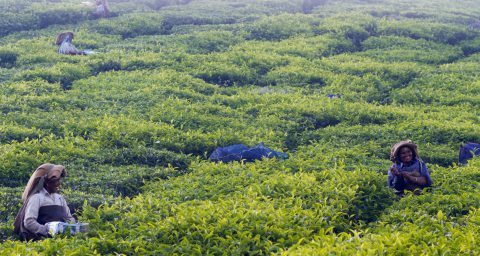 Therefore, finding ways to rise to the challenge of producing food for nine billion people by 2050 in an increasingly unpredictable climate is a key global priority. A decade of weather extremes (Nature Climate Change, Volume 2, p491–496, 2012). 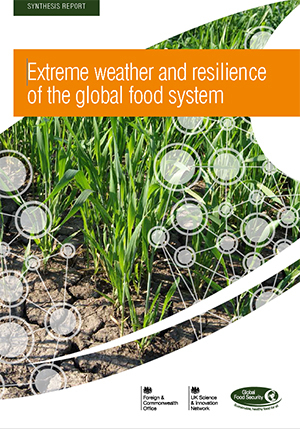 Extreme weather and resilience of the global food system (GFS, 2015).